The Cerro Aconcagua, Mount Aconcagua is located entirely in the department of Las Heras of the province of Mendoza of the Argentine Republic. 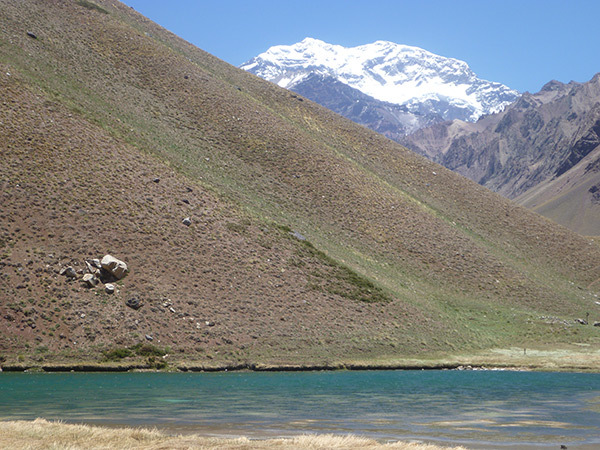 It is located within the Aconcagua provincial park. Aconcagua is the highest peak of the southern and western hemispheres; it is also the highest mountain on Earth among those located outside the Himalayan system. It has two main peaks: the northern summit, 6960.8 masl (22 837 ft) and the southern summit, 6930 masl. In this sector of the border of Argentina and Chile the boundary between the two countries is established by the line of watersheds and the hills of Catedral and Tolosa prevent the thaws that are born in the Aconcagua from heading towards the Pacific Ocean, being tributaries of the Atlantic. To the north and east it borders the Vacas valley and to the west and south with the lower Horcones valley. Several glaciers cross its slopes; the most important are the Northeast or Polish glacier and the East or English glacier. In this trekking six day. 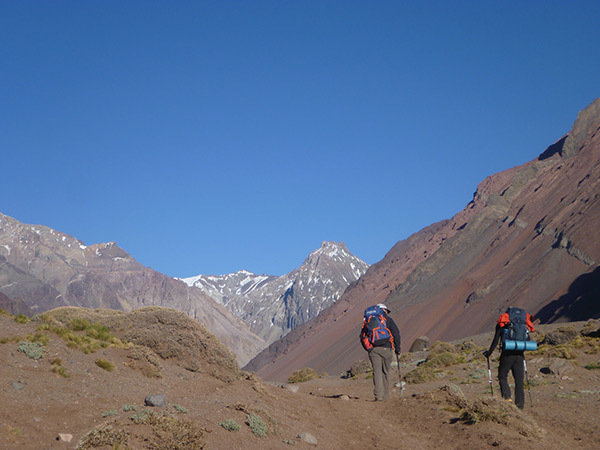 We will visit the two most popular faces of Cerro Aconcagua. First We will visit to Plaza Francia, second we will visit Plaza de Mulas the main Base Camp of Aconcagua the highest peak in south America. There will give us the chance to spend some time with mountaineers from all over the world, finally we will walk up to Cerro Bonette 5100m. Enjoy the beautiful impressive views surrounded by amazing mounts. 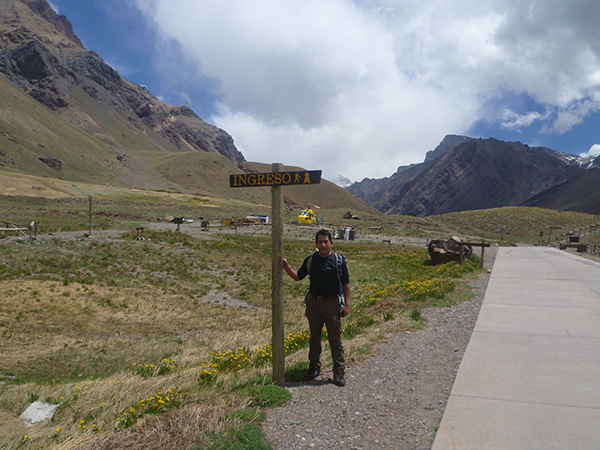 Day A.- Arrival to Mendoza 760 m.
Day 1: Mendoza – Penitents 2,725m. Before going to penitents, the whole group will apply for the climbing permit with the guides assistance. You will have lunch and spend the night in penitents hostel. In the afternoon, the mules are loaded and prepared for the following day. 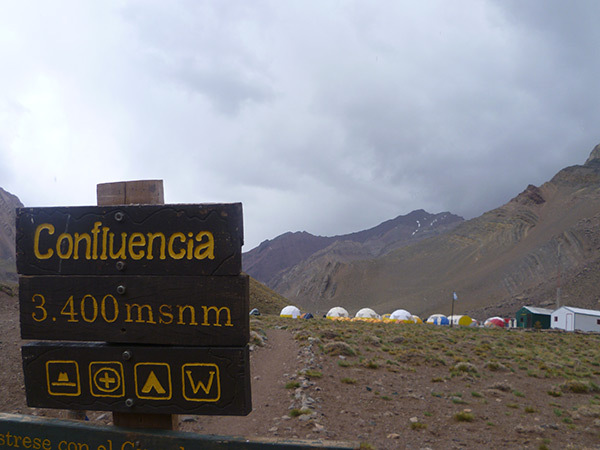 Day 2: Penitentes – Confluencia 3,300m. The group will be taken to the entrance of the park in a private van. 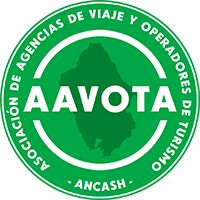 There permits will be presented and you will start with trekking to confluencia camp. The equipment will be carried by mules. Day 4: Confluencia – Plaza de Mulas 4,300m. Option 1.- Short trek in plaza de mulas and resting day .